On November 1, in Lviv, the first children's tournament under FC Shakhar’s Let’s Play! project took place. 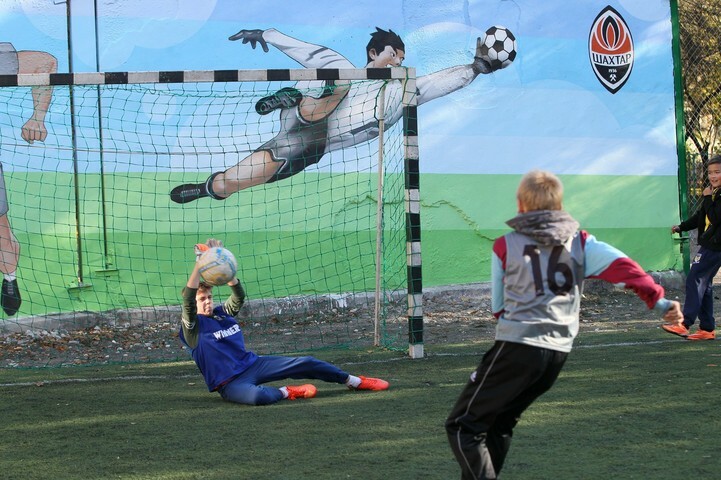 We would like to remind you that the project has successfully been implemented in Donetsk for several years, with hundreds of kids playing football under the guidance of experienced volunteers, trained by the club. FC Shakhtar regularly organizes master classes for kids and conduct competitions. A month ago, the project started its work in Lviv. The first tournament was attended by 40 pupils aged between 7 and 12. Children formed five teams, which were named according to the names of the favourite players Shakhtar’s senior team. Each team played four matches, after which the games were held for prizes. In the end, Pyatov team became the winner. The second place was taken by the guys from the team Marlos. The bronze medal went to the team Teixeira. Individual awards for the best players under the age of 10 to 13 were received by Vyacheslav Zapovskiy and Oleg Malkevich. - I used to play football in the street - it is interesting to be in the project! - Vitaliy Kravets, captain of Pyatov team, shared his emotions. - I am glad that we won, I was very nervous when the ball was near our goal. I will leave the Cup in the team - this is our common trophy. Each participant will receive a prize from FC Shakhtar, and the winners were awarded the Cup.